community in a capacity that highlights the importance and benefits of maintaining and prioritizing mental health. I think this emphasis on mental health will be important as I continue my education at Eastern Connecticut State University and inevitably face a challenging, stressful time during the course of my studies. However, I would say to anyone who is listening: sometimes the ones who grew up with scarce resources end up being the ones who appreciate and take full advantage of the opportunities given to them because they know how hard things can be when given very little. I plan to confront any challenges or difficult times during my college education head-on, and continue to set big goals for myself. TheDream.US scholarship has enabled me to focus on my future with less anxiety and more hope that I can successfully contribute to this country in the way I want to. I have told my immigration story to many people. Some don’t understand; others simply won’t understand. 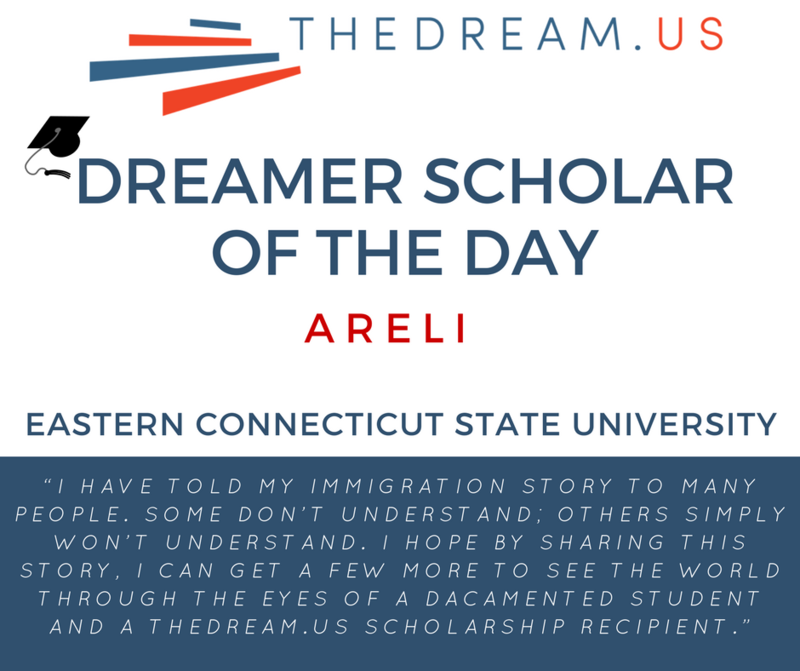 I hope by sharing this story, I can get a few more to see the world through the eyes of a DACAmented student and Dream.US scholarship recipient.